As the growing season winds down and I clear out beans gone by and weeds gone crazy, I worry about my garden soil. Did it get a fair shake in terms of what I asked of it and what it gave back? There is no way to know if I bankrupted a bed’s nutrient supply or made nice gains building organic matter with compost and mulch, but autumn brings an easy chance to set things right. Growing green manure crops at the tail end of the growing season restores overworked soil, prevents winter weeds, and few sights are prettier than a lush green manure crop growing in a spare winter garden. First, let’s define a green manure crop as a cover crop grown specifically to benefit the soil. Depending on your climate and plant choices, green manure crops planted in fall may keep growing all winter, stay alive in a semi-dormant state through winter and start growing in spring, or they may be killed by cold temperatures. I’ll start with the latter group, comprised of plants that are killed by cold just as winter finds its feet, because they are the easiest option for vegetable gardeners. The best thing about this group of plants is that you don’t have to terminate their lives with sharp tools. Nature does the job. Take oats, for example. Seeds sown in still-warm fall soil quickly grow into grassy clumps, but only one or two nights of temperatures below 20°F (-7°C) kills the plants dead. Great! Now you have a winter mulch. By spring, the roots have rotted away, and the old tops can quickly be raked up and composted, or used elsewhere in the garden as mulch. Mustards fall into the half-hardy category as well, as do daikon radishes, which are sometimes called “biodrill” crops because of their ability to grow long roots that penetrate dense subsoil. I admit to harvesting most of my daikon radish roots rather than letting them rot in place, mostly because daikon radishes make such great fermented vegetables. Fortunately, the discarded tops from the harvested bed are usually plentiful enough to form the base layer of a good winter mulch. In addition, several half-hardy flowers can be used as green manure crops during the short fall season, including calendula, phacelia, and poached egg plant (Limnanthes douglasii). 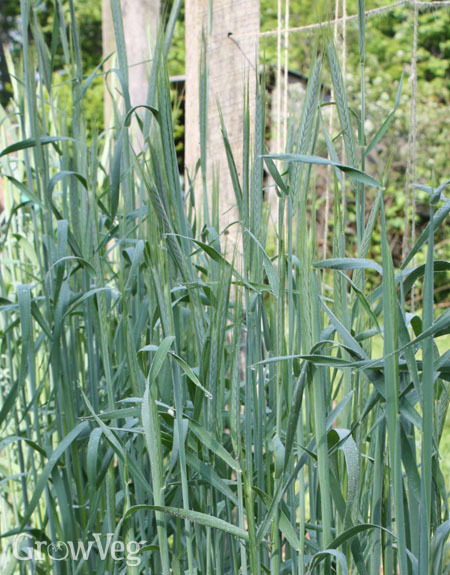 You could seed them on purpose in late summer, but a better approach is to “plant” fall cover crops of these and other flowers by shaking seeds from old plants over places in the garden where you want to see a cover of green in the fall. It can be great fun to work with fall-sown crimson clover, which passes winter as a small rosette of leaves, and then explodes with growth first thing in spring. Crimson clover is rated as hardy to 0°F (-18°C), but you can increase its cold tolerance by covering the planting with row cover (garden fleece) spread over the bed and held in place with bricks or boards. As if crimson clover were not beautiful enough, adding hardy annual flowers like bachelor’s buttons and poppies puts a pretty twist on green manures, with the novel benefit of providing pollinators with nectar and pollen early in the season, when it is needed most. This group of talented plants can survive temperatures to -20°F (-29°C), but more importantly they know how to handle winter. Field peas and beans, vetches (called winter tares in Europe), and winter wheat and cereal or grazing rye grow only a little in the fall, hunker down in frozen winter soil, and then show such exuberant growth in spring that it’s scary. I’ll never forget my first experience growing all of these plants in a green manure mixture many years ago. The quiet progress of the plants through winter did not prepare me for the chest-high thicket of stems and vines that jumped up in spring. How was I supposed to turn that under? I have since learned to take down the plants at a young age, when they are just starting to bloom. I use the tops as green manure for composting, and let the roots rot in place. Regardless of which green manure crops you choose and how you handle them, in spring you will see clear evidence that busy soil is happy soil. The soil I shake from wheat or rye roots falls in a loose shower because it is so thoroughly riddled with hair-fine rootlets. The white nitrogen nodules on the roots of field peas or vetch look like synthetic fertiliser granules, though I’m sure the soil likes them much better than chemicals from a factory. When you see little miracles like these from fall-sown green manure crops, you will know your soil is where it needs to be to start the new season. "Going to try overwintering fava beans here in northern Nevada. First time for a cover crop but hope it will help break up the soil and enrich. And maybe we'll have beans come spring!" "I grew field beans last year over part of my garden. They grew to 4 feet; we chopped and dropped them in place in the spring before tilling the garden. There were very few weeds during the winter in that area of the garden and a noticeable difference in perennial weeds this growing season. I am awaiting a new batch of seeds and plan to cover as much as my garden as possible this fall. " "The scarlet clover has been marvelous in our garden the last couple years. About to plant again and will add some of the bachelor buttons this time. The clover is beautiful growing, and chokes out most weeds ( I still find a few). By April these are 12-16 inches high (we gett ~ 100 inches of rain)! Two Weeks before spring planting I use a hedgetrimmer and cut them down in three passes. Trying to turn these long stems in causes problems, so cutting into 3-4inch sections keeps the bed in better shape. A little turning and bed is ready in a couple weeks for planting. Wonderful to nourish the soil, keep weeds down AND have something beautiful to look at. ...doesn't taste bad either, a few leaves here and there. ...haven't rolled in it yet -- LOL. I'll soon put a video in garden section of my RelentlessHomestead YouTube channel - and will include pix from prior year." "Talking about Daikon radishes...What a wonderful vegetable to grow! Don't throw the tops in the compost but put them in your salad. There is NO waste with this veg. I love them!!"